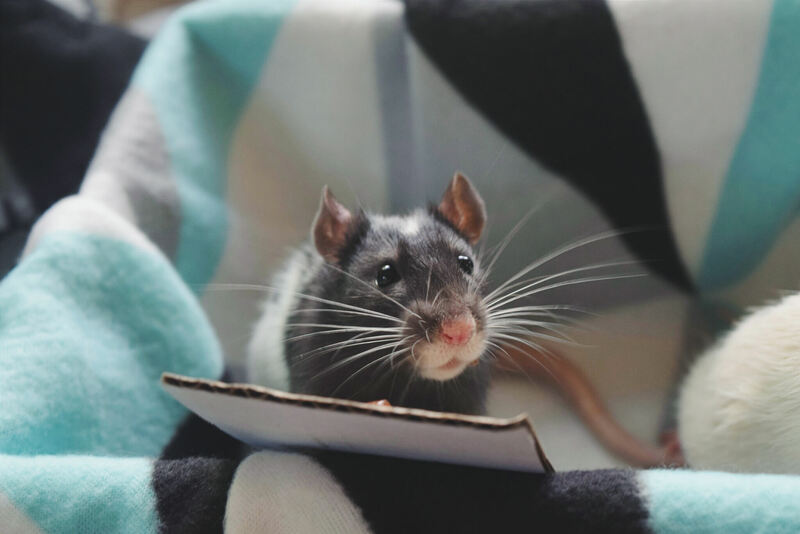 After pawing through hundreds of photographs of adorable adopted animals and painstakingly narrowing the list down to 50 finalists, we’re happy to announce the winners of PETA’s Cutest Adopted Companion Animal contest. While we recognise that all the animals entered into the competition are worthy of the title (the judges are still recovering from a severe case of cuteness overload), the results are in, and Apollo has won! Apollo was in need of a home after the employees at a pet shop in Cairns, Queensland, failed to separate any of the rats by gender. His mother gave birth to eight babies when only a few months old herself. She died of health complications shortly afterwards. 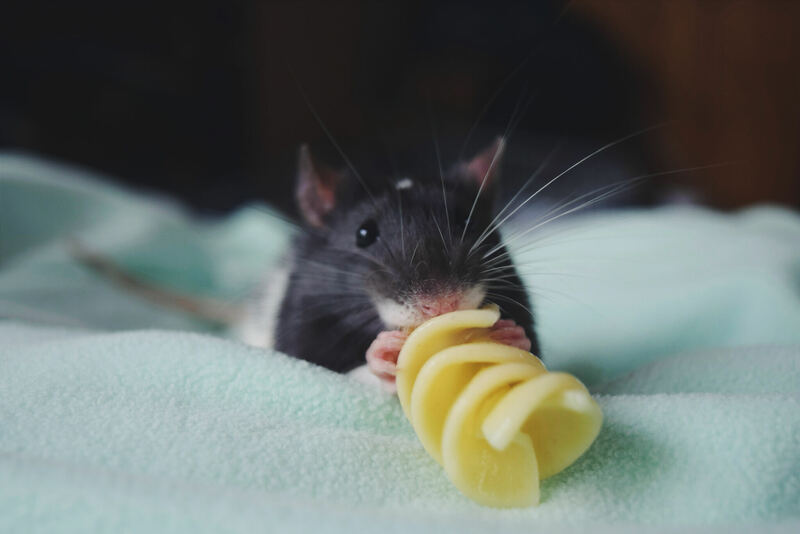 Apollo was adopted and, in his guardian’s words, “now lives the luxurious lazy-rat lifestyle with two rat friends, getting to snack on pasta and relax in his favourite hammock”. His guardian continues, “He will never have to face neglect at the hands of a pet store like his mother did”. Apollo’s story serves as a great reminder to avoid pet stores that sell live animals. 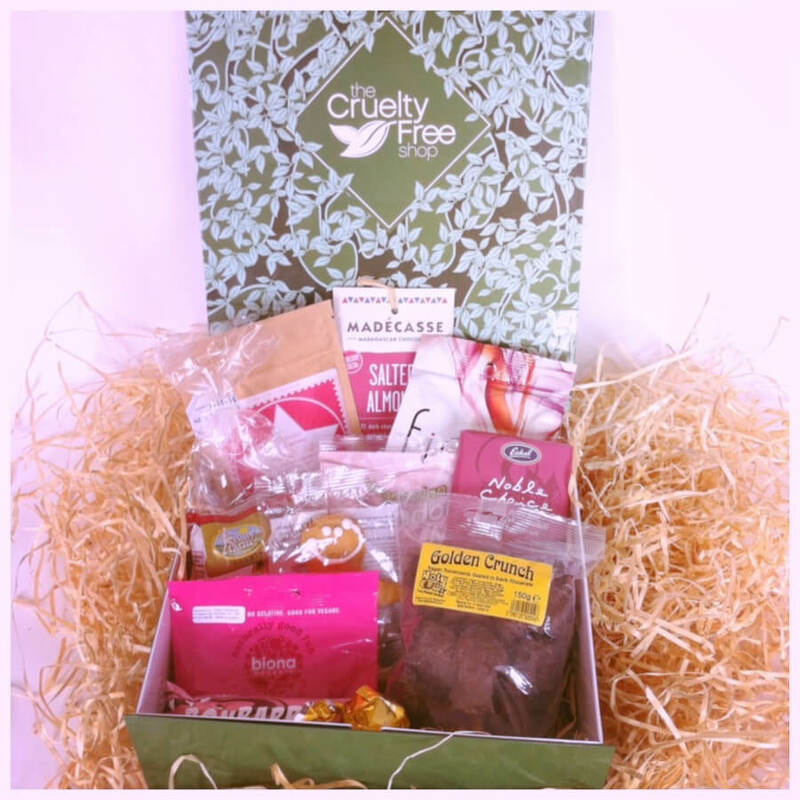 His guardian will receive a PETA logo T-shirt, a certificate, a pack of animal treats, and a Sweet Treat Hamper full of goodies worth $69.95 from The Cruelty Free Shop. All the adorable second-place winners have remarkable adoption stories that are sure to warm your heart. Their loving guardians will receive a PETA logo T-shirt and a certificate. Lilly was adopted from a rescue group after being left alone and unwanted in a tiny courtyard. She was born deaf and had a steel rod protruding from her chest, which was left over from a broken leg she’d sustained as a puppy. A vet said that Lilly’s joints were already arthritic, at just 2 years old. She was already an incredibly resilient dog, and I used all the money I had to get the most highly regarded surgeon in the state to operate on her to relieve some of the issues with her joints. Now, it is a matter of quality over quantity in terms of how long she is with us. Lilly takes cues from Hazel and is reasonably obedient (when she wants to be!). She is extraordinarily affectionate, and I’m lucky to have found her. Lilly is an amazingly patient and empathetic dog, given her history of medical issues and neglect. I’ve been a foster carer (of little people) on and off for the last few years, and Lilly’s responses to being poked, prodded, and sat on are truly a testament to what a good-natured dog she is. I’ve seen her be incredibly gentle and patient with children who have never had contact with domestic animals before, to the extent that she has helped to teach these little people about being safe and gentle when meeting new dogs. Ash was rescued from the racing industry and picked up during bushfires – hence, his name. When his guardian enquired about adopting him, she found they shared the same birthday (5 September) and knew then that it was meant to be. We’ve shared our lives for three years now, and it’s been great. Ash is a “throwaway greyhound”, one who is bred to race but has no inclination to do so ­– in my mind, one clever boy. Luckily for Ash and me, his owner chose the path of adoption for him – many others are not so lucky. He came to me at 2 years old and has lived a happy life with 14 cats for the past three years with not one mishap. He witnessed his first cat fight, went to take a look, was scratched on the nose, and now ignores them completely. He is my best friend and companion. I like to think we complete each other’s lives, and I would be lost without him in my world. Adopting Bernie was one of the best choices we have made, both for us and for our other fur child. They have quickly become best friends and never leave each other’s side. Bernie has the sweetest personality and can bring a smile to anyone’s face. He loves playing in water, chasing balls, and – most importantly – giving cuddles. We simply couldn’t imagine life without him now! Turtle was abandoned on the street with her three kittens. All the kittens were adopted, but Turtle struggled to find a home. She has the cutest heart on her chest! I think my cat is a great example of why people should adopt: she’d been left behind, but she is the friendliest girl and definitely deserved a loving home. Milor was found dumped by the river in a box full of rubbish, covered with his own excrement and urine, with hundreds of fleas. The box was taped shut, but luckily, his guardian’s dogs – who adore kittens – sniffed him out. He was only 3 weeks old, but his guardian bottle-fed him and nursed him to health. The little devil has made it all a distant memory and now enjoys nothing more than tearing up and down our house, climbing the blinds and snuggling with his two doggy rescuers. Milor – although born a cat – believes he is a dog, and he finds comfort in his canine companions. He sleeps with them, shares their food, and plays with them. He comes when called and even joins them in the bath. How someone could dump this amazing little fluff ball in a box of rubbish to die is beyond me. He has had such a terrible start to his life and deserves nothing but the best. When I adopted Leela, she had fur missing from her paws and ears and was especially scared of men. A few years on, her nature is as beautiful as she is. She’s no longer scared of men. She LOVES car rides, the beach, cats, and dogs and won’t leave the park until she’s said hello to everyone – big and small! There were so many fantastic entries to this competition, so we wanted to share a few more with you. To see photos of all 50 finalists and read their stories, you can view our Facebook album here. Pedro came from a commercial piggery, and his brothers and sisters were tragically sent to the abattoir to be killed. Lucky Pedro was rescued and now lives with a loving family in Melbourne. Talking about this photo, his guardian says, “This is Pedro sleeping in front of the fire with his baby piggy. He adores our kids and loves playing with them for hours. He has also learnt how to sit and walk on a lead”. Humphrey’s rescuers found him alongside seven other kittens dumped in a box of old Christmas decorations. They adopted him at 12 weeks old, and he weighed just 700g. After Humphrey’s unfortunate start to life, we are so thrilled that the vet has said he is now a happy, healthy cat. He has put on the perfect amount of weight and has enough energy to run around the house and play. We are so lucky that we get to experience his little personality every day. He is a funny little boy and loves to play in water. He’ll even come and sit in the shower with you! He is such a smooch, too: he loves getting cuddly – especially at night. We are so lucky to have such a beautiful-natured cat that we couldn’t imagine our lives without him! Bug was found in a box on a construction site with no mother or brothers and sisters in sight. Despite being at death’s door, this lucky little girl was rescued and hand-reared by veterinary nurses. Her quirky eyes meant she struggled to find a home, but her guardians fell in love with her the second they saw her. She now lives like a queen, and despite her rough start, she still likes a good cardboard box. One eye looks straight and the other at her toes! In a home where she’s loved and part of a family. Thank goodness we rescued her on that winter’s day! Angus was adopted two years ago from a greyhound-rescue group. He was skinny and shy at first but has since made leaps and bounds and is now thriving in his permanent home. His guardian tells us that he “spends his days munching his veggie treats and sleeping with his siblings, who include guinea pig brothers, rat sisters, and kitties”. I rescued my now best friend at 6 weeks from a family that didn’t love him the way he deserved. He’s now the happiest chappy who gets filled with love and cuddles every day! He brings so much joy to us in return. Rossi is the most beautiful, loving, funny, and obedient fur baby out there. He loves a sleep-in and an afternoon nap, just like me, which makes him the perfect cuddle buddy. He’s a lover of all other dogs and animals and has an incredible temperament. He’s so special to all of us and has fitted into our family so perfectly. The gorgeous Bundy was adopted from a local shelter, where workers had almost given up hope of finding him a permanent family. There was no looking past this boy who had given up and wouldn’t even look at us – we knew we needed to adopt him. We took him for a walk and then dog-proofed our yard before bringing home our baby. He has now travelled 36 hours with us when we moved and is so settled, like a different dog! We are still mystified as to how this beautiful dog was even still available after months of waiting. Bundy is a rescue who has made such tremendous progress over the past 11 months. He was very reactive and fearful of people, dogs, and cars, and now it is extremely rare for him to get upset. He adores people now. He loves cuddles, and his jumper is his favourite thing ever! Thank you to all who entered. Of course, every animal who has been adopted is a winner. Inspired to help animals? Be sure to desex and microchip all your companions, and choose to adopt, rather than supporting breeders or pet shops. Each of these small actions makes a huge difference. Success! Kiki’s puppies are being adopted!